Happy Rocktober, everyone. Rounding out a month of 15 assignments, the last one was Roger Waters of Pink Floyd performing The Wall. Not a bad way to end the month, especially when it means shooting a legend for five songs from the pit.Here's a shot of Waters performing with kids from the Matthew Dickey’s Boys’ & Girls’ Club. One thing I loved about this shoot was just how much fun it looked like Waters was having on stage. Stay tuned for the full set with the shooting notes. Hope you've had a good Rocktober, too. I guess with original member, Syd Barrett and keyboardist, Nick Wright both passing recently, Roger Waters figures it’s best to keep a happy outlook, tour, play music, maybe make up with the remaining members of the band and have a good time. Our time on this planet is short, make the best of it!! Nice work Todd, can’t wait for more photos! Tood I envy you the photos of Roger Waters. 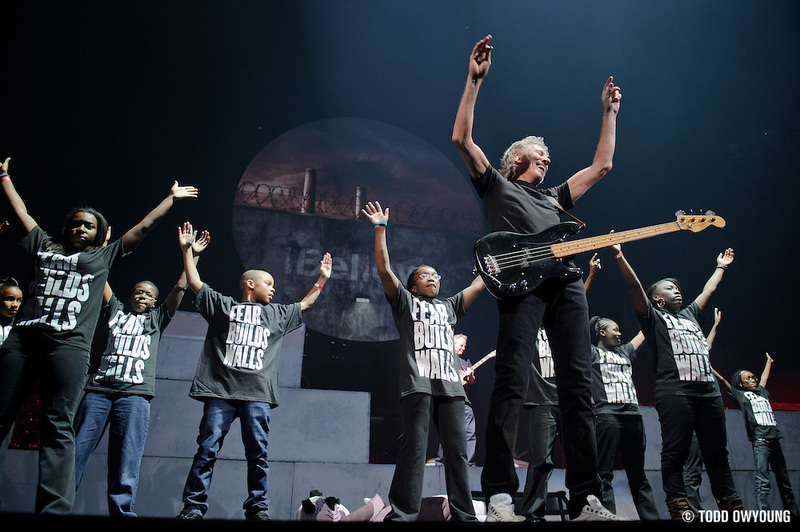 In Poland, Roger Waters playing a concert in April 2011. Is trying to obtain accreditation, but every time I get a negative response. You give me some advice?